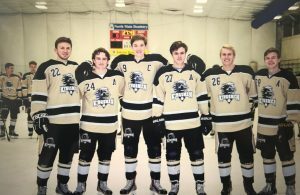 On Friday, October 20th the Penn Hockey Team faced off against the Adams Eagles in a long, back-and-forth game that went into overtime and a single-round shootout to end the game. Adams held on for a 5-4 victory. The Eagles started off the high scoring game with a goal, only four minutes into the first period. The first period ended with a 1-0 score in favor of the Eagles. Penn fought back and put two in the back of the net, the first by Junior Ryan Calhoun, and the second by Junior Nick Harman. With only a couple minutes left in the second, Senior Forward Charlie Platt rifled one into the back of the net to give the Kingsmen momentum going into the third period. However, penalties came back to wound the Kingsmen, including five penalties in the third period. Harman scored one more in the middle of the third, with Adams coming back to tie it up one more time. At the end of the third the Kingsmen were hyped up to score in overtime to win the game. However, things didn’t go as planed and the score remained 4-4 at the end of overtime. In the shootout, Adams went first and put it in.